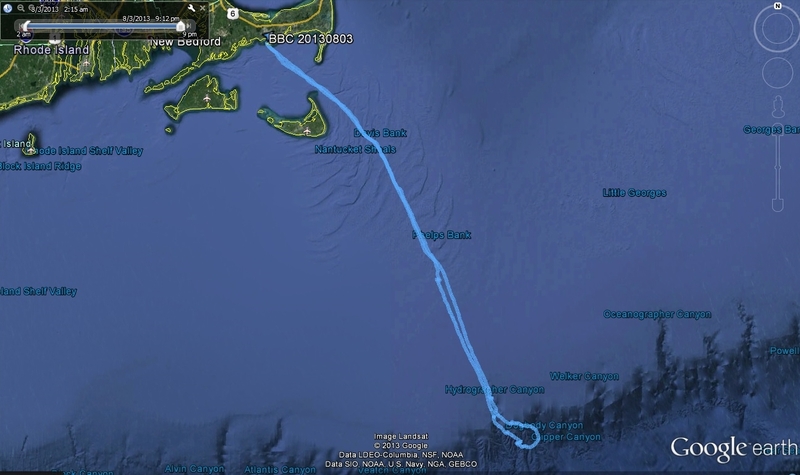 Weather: Mostly Sunny for most of the trip with brief period of moderate rain in the afternoon just south of Nantucket Shoals on our return. Excellent visibility throughout. Winds WSW @ 8-15 mph. 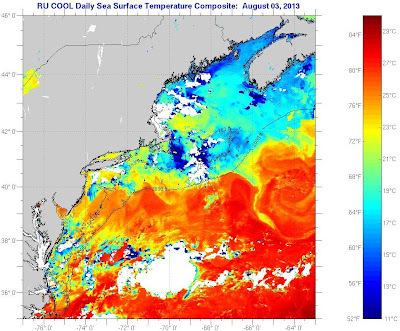 Air temp approx mid-60s to upper 70s. 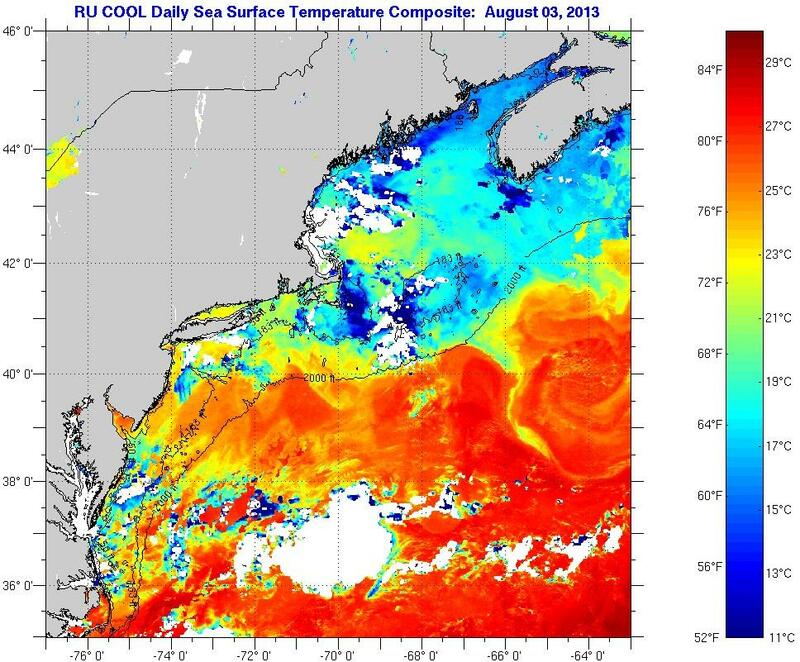 Water temps: Coolest 55 degrees Fahrenheit on Nantucket Shoals, warmest 74.5 degrees Fahrenheit southeast of Hydrographer Canyon. Leaders: Mark Faherty, James P. Smith, Nick Bonomo. Huge thanks to Ida Giriunas and Naeem Yusuff for the monumental task of putting these trips together. Forty participants and three leaders joined Capt. Joe Huckemeyer, first mate Matt & crew for a fine day of pelagic birding. 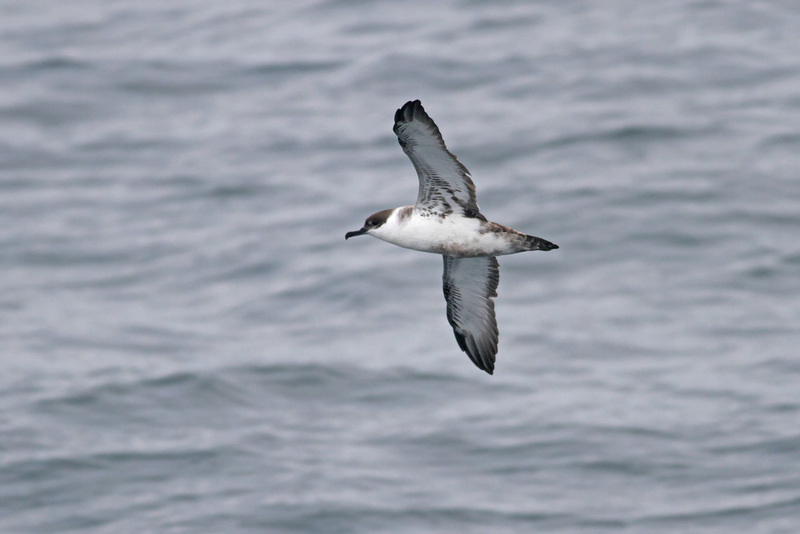 Following an early morning departure, dawn found us on the southeastern edge of the Nantucket Shoals with numbers of Great Shearwaters and a few Sooties sprinkled in. 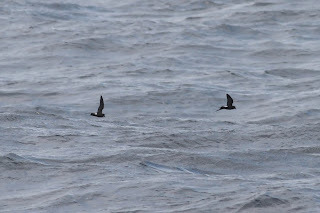 Our first Leach’s Storm-Petrel around sunrise on the shoals was a sign of things to come for this species today. A few Red and Red-necked Phalaropes were seen in flight only. 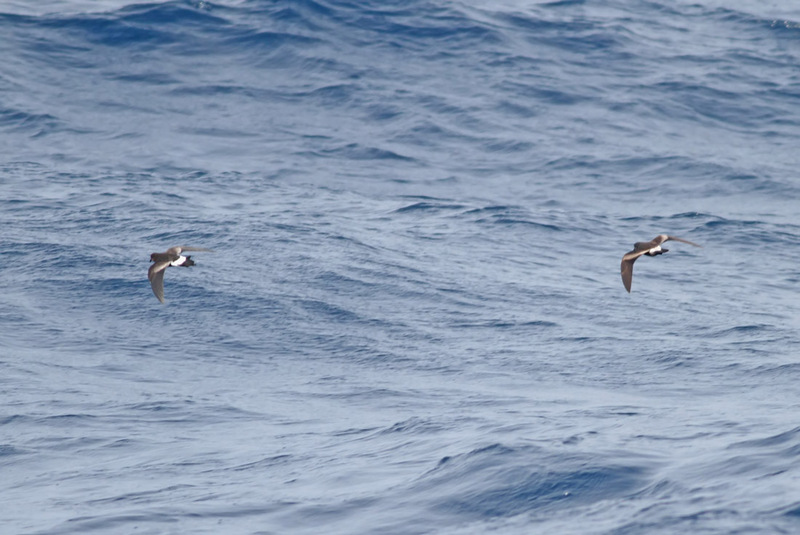 The birds thinned out as we made the run between the shoals and the shelf edge, as they often do. Upon reaching the tip of Hydrographer Canyon around 0900 we immediately came into numbers of Wilson’s Storm-Petrels and a handful of Leach’s. 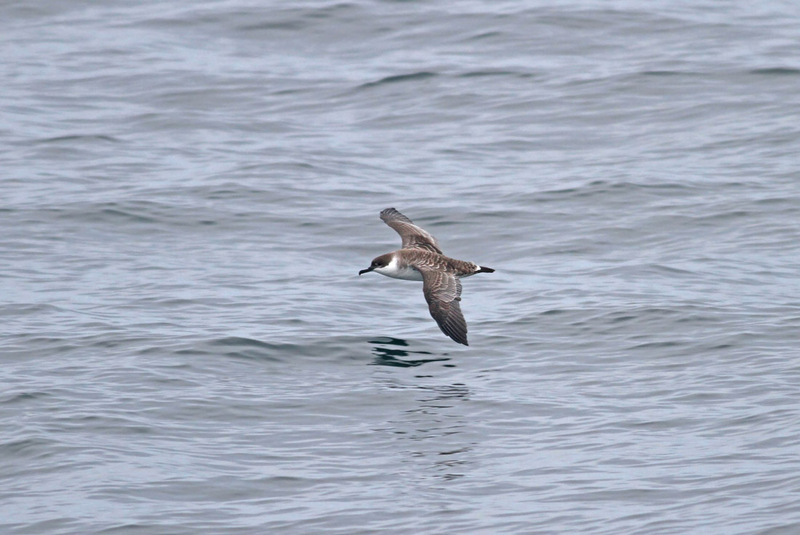 Our first of six Audubon’s Shearwaters was seen in 72 degree water near the tip of the canyon. 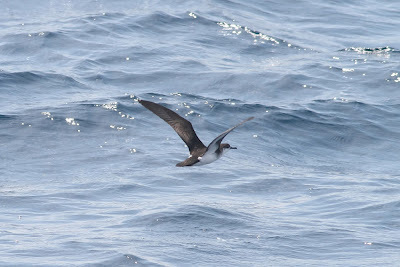 We worked our way down the east wall of the canyon, sorting through the storm-petrels and finding several more Leach’s. One particular pair of Audubon’s Shearwaters allowed close approach, so everyone on board had the chance to see this warm-water species well today. We cut across the southeast corner of the canyon and headed to a steep dropoff between Hydrographer and Dogbody Canyon, but found few birds here. From here we motored south, looking for warmer and deeper water southeast of Hydrographer Canyon. 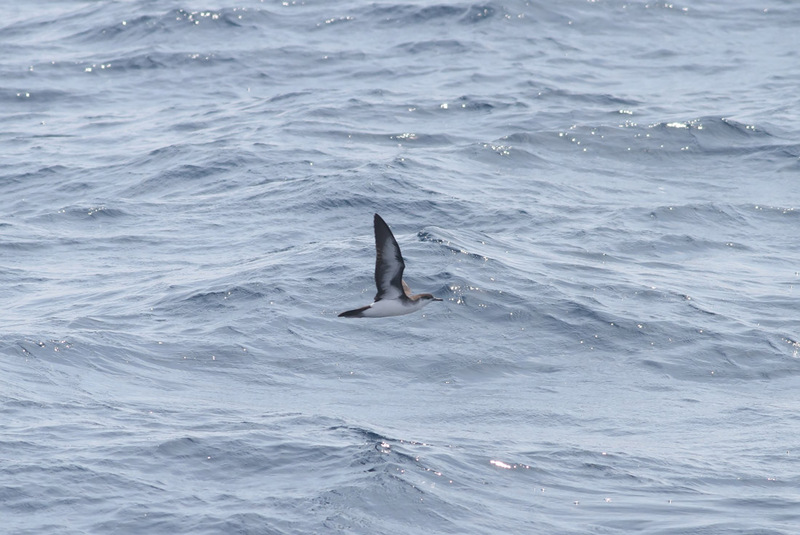 It was in this warmer (74.5 degrees), deeper water that we tallied eight BAND-RUMPED STORM-PETRELS scattered among the Wilson’s and Leach’s. 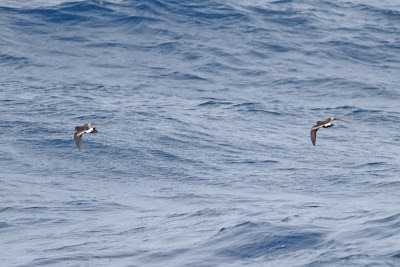 As is typical for the species, they proved very elusive, with only brief views before fleeing the boat. 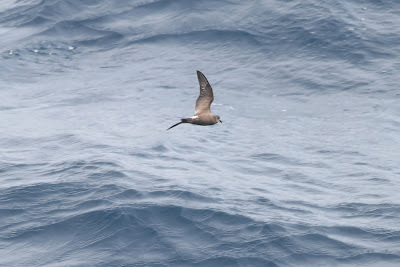 Before turning back to the northwest we spent 40 minutes chumming in the deep water, which eventually did the trick of attracting two Band-rumps close enough to the boat for most to see, though they did not linger for long – life birds for several folks. Our return trip brought us back through the mouth of Hydrographer Canyon and along its west wall. 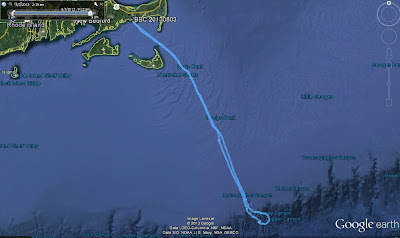 We found ourselves back on the Nantucket Shoals after a bout of moderate rain in the late afternoon. 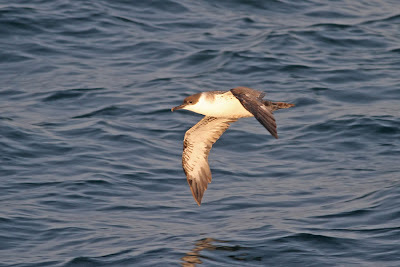 We picked through the numerous Great Shearwaters to find a few more Cory’s and Sooties. The only Manx of the trip was seen by just a few birders from the stern, giving us a five shearwater day. A distant SKUA was seen briefly by just a few on the horizon, eluding identification. Later in the afternoon we had another encounter with a skua, this one also rather distant and brief, flying into the sun glare and vanishing. This bird was left unidentified from field views as Skua versus Pomarine Jaeger, pending photo review. 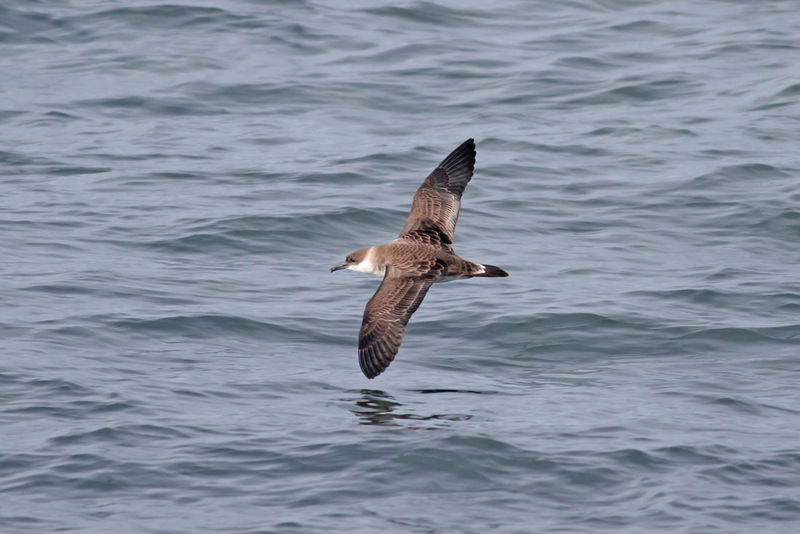 Indeed the photographs reveal a SKUA, the identification of which is still being discussed. Plumage and molt strongly suggest South Polar Skua. 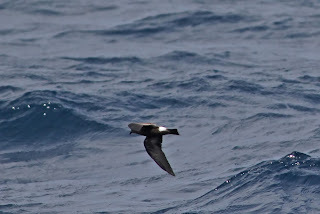 Band-rumped Storm Petrel, possibly "Grant's". 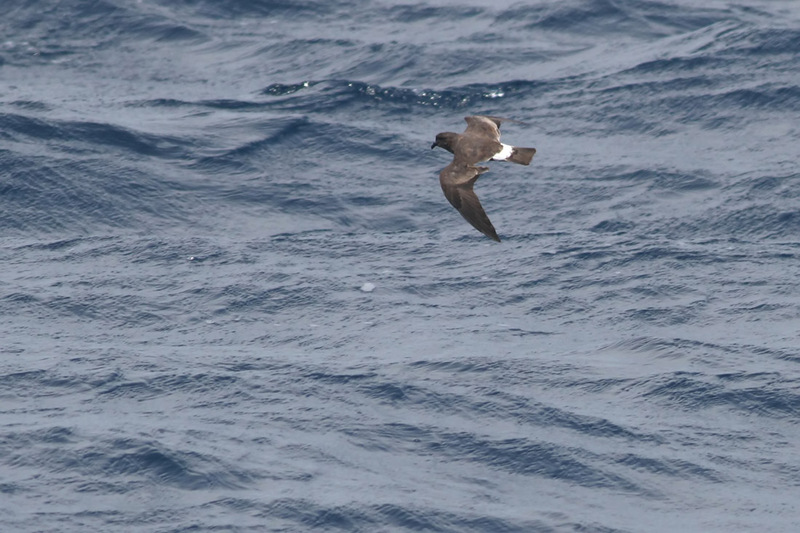 Close examination of photos shows both wings with no old primaries and one outer growing in (presumably p10). 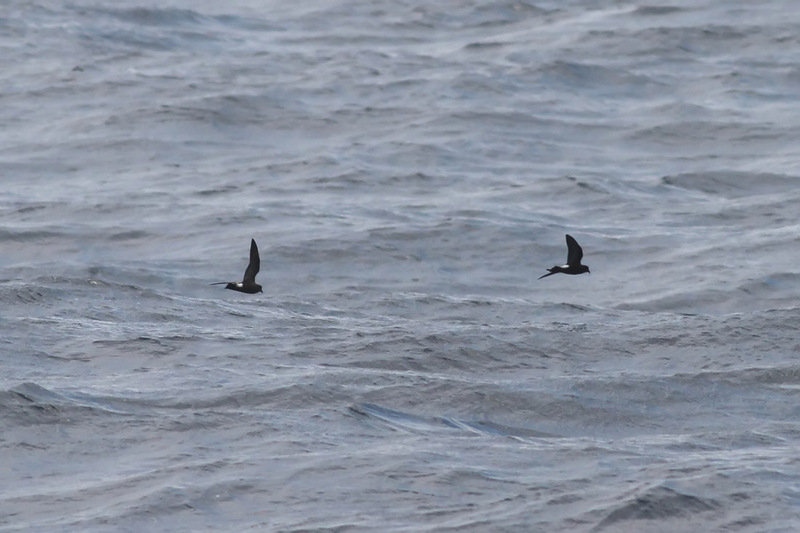 Band-rumped (left) and Wilson's Storm-Petrels. A different individual. 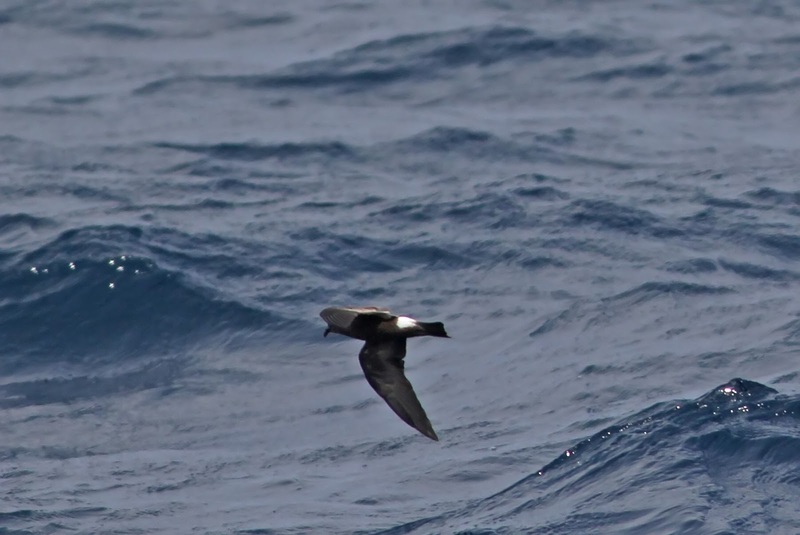 To me this bird did not immediately "pop" as a large storm-petrel in the field until flight style was noticed. In this photo it appears slightly built with narrow wings. No sign of active wing molt. Unfortunately this is the only decent photo of the bird I have. Form unknown (well, they're all unknown!). Thank you to all participants for your contributions including spotting some really cool wildlife!